Monday is an "enjoy it while you can" day, as warm temperatures will disappear as quickly as they arrived. Today, for the first time in two weeks, temperatures will get into the 70s, according to NBC Washington meteorologist Tom Kierein. And we'll see some blustery southwest winds, as well, with some gusting to more than 30 mph. Late Monday night and into early Tuesday morning, however, we will have a strong cold front moving into the region from the west. That front will likely trigger showers and thunderstorms from near dawn Tuesday until early afternoon. There is only a slight risk that those storms will produce damaging winds. After the front goes by, temperatures will drop rapidly into the 40s by sunset, and we will have some gusty northwest winds over 30 mph. 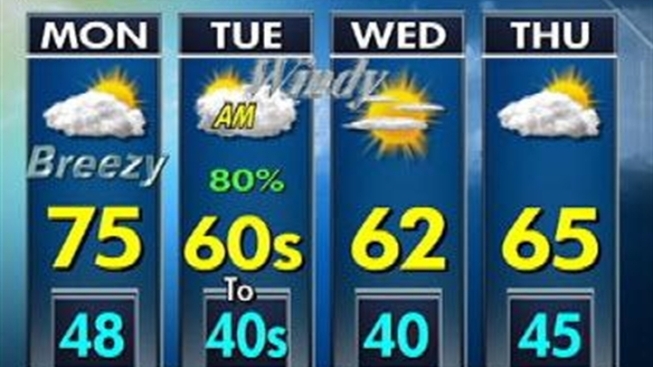 Temperatures will rebound by the end of the week back into the 60s to near 70 degrees on Thursday and Friday. They will remain mild into the weekend.